When one talks about a vegetarian protein rich diet, they think that our meals maybe very boring with just dals, sabjis and rice or rotis. For this Mega Blogging Marathon, I’ve tried to showcase basic protein rich ingredients that can be made into some exciting, delicious, tasty meals. When one talks about tasty meals or dish, the first thing that I can think of is chaats. Yes Chaats. So, what are chaats? They are basically a mixture of basic ingredients made into a lip smacking, tasty dish with a melange of all tastes…sweet, sour, salty, chili and not so bitter. Right from Kashmir to Kanyakumari, ( no please don’t start singing the song Kashmir main tu Kanyakumari, north south ki doori…. ), chaats are very popular. It is said that chaats originated in Uttar Pradesh and are now a very popular road side/ street food all over India, Pakistan, Bangladesh and Nepal. Bhel puri, pani puris, puchkkas, idli chaat, ragda patties, dabeli, vada pav, momo chaats are dishes you’ll find in every corner of India. 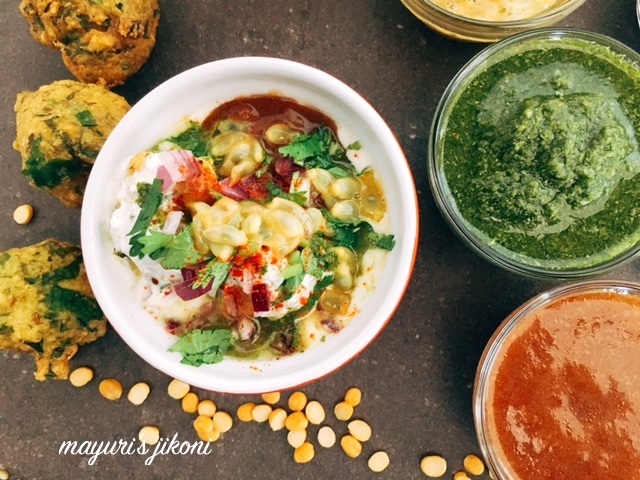 With such a variety of chaats, its only fair that I include a chaat recipe for this theme. I made the normal pakodis with spinach for the added protein source. I must say the chaat was so tasty. So who says vegetable based proteins are boring? Come to think of it some of my most favorite snack dishes like dokhra, khandvi, fafda, pudlas, arvi paan, gotas all contain loads of chickpea flour which is rich in protein. Another point to note when one is taking part in a Mega Marathon,not only is food the main topic for 2 months, thought in your brains are food related, you’re more often glued to the computer but also you sometimes tend to forget an ingredient when you do the photo shoots. As I was taking the photos for this dish, I knew I was forgetting something but just couldn’t remember to save my life! I took the photos, put back everything and waited for dinner time. Its when we sat down to enjoy the chaat that I realized that for the photos, sev was missing. I didn’t take additional photos as night photos turn out really bad but sev is very much a part of any chaat. 1. Soak chana dal and moong dal overnight or for 6 hours in warm water. 2. Wash and put in into a blender jug. 3. Add sufficient water, cumin seeds, ginger and garlic and chillis if you’re not chopping them. 4. Grind the lentils into a coarse paste. 5. Remove the ground paste into a bowl. 6. Add salt, turmeric powder, soda bicarbonate and spinach. Mix well. 7. Heat oil in a frying pan, kadai or wok over medium heat. 8. When its hot, using your fingers scoop up a bit of the batter about a tablespoon full. 9. Drop it into the hot oil using your thumb to slip off the paste. 10. Repeat steps 8-9 till you have 6-8 pakodis frying. 11. Fry them till they are light golden in colour. In between flip them over so that they fry evenly. 12. Remove the pakodis from the oil and put it in a kitchen towel lined colander. 13. Fry pakodis till the batter is over. Add salt, sugar, cumin powder, red chilli powder. Whisk it till its smooth. Put 4-5 pakodis in small or medium bowls or a deep plate. Sprinkle some chopped onion, coriander and passion fruit pulp. Top with some sev and serve. I could not find pomegranate to add on top and therefore replaced it with passion fruit. I loved it as it added a bit of sourness whereas hubby didn’t like it. Left over pakodis can be enjoyed their own with some chutney. Add chopped green chillis on top if you prefer. Try and use as little water as possible to grind the dals. If the batter becomes too watery, you may not be able to fry pakodis as the mixture will disintegrate in the hot oil. If its too watery add some chickpea flour (besan). Wow I have never used this proportion for making pakodis..must try them as such as I get hold of palak! I can totally relate to forgetting some ingredient during photo shoot. And for chat, it becomes too confusing as there are so many ingredients. Even without the sev, the chat look amazing. I can live on chats for months. That's a lovely protein twist to chaat. It looks fabulous! P.S. I think that song is pretty catchy! I am just drooling over the palak pakodi chaat and it looks so addictive without the sev, so don't worry about that. What an idea Mayuri! Love this chaat and I am going to bookmark this. Yummy chaat.. Street foods made in home are always healthy and yummy.. I completely agree. Till I completed all the recipes, my brain was thinking only about the recipes and the ingredients. To be honest, even without sev this is one lip-smacking chaat. Simply love it. Mayuri my daughters will love this chat. I have always assumed that for pakodi chat the palak is to be dipped in batter and fried. And I have avoided it like plague. This is yummy. As for the sev I know what you mean I too keep forgetting especially the sev bit. this chat is so fascnatic and looks exotic too. I drool over chats ! They are my weakness and I am drooling over this one too . Excellent chat with pakodis. Omg, dont torture me like this, chaat foods are my weakness and this palak pakodi chaat is killing me, what a fantastic alluring chaat. Most of my pics are taken in a hurry-burry. I can fully understand forgetting some ingredient during photo shoot. That chat is very inviting. For getting g a garnish during photo shoot has happened several times!! The chaat looks so delicious and I would love to have a bite!